When Eliott Rosenberg learned that Brown professor Jim Head had worked with the Apollo astronauts, he jumped at the chance to take his class. That decision led to a summer of research, new insights into the climate of ancient Mars, and a peer-reviewed publication. PROVIDENCE, R.I. [Brown University] — When Eliott Rosenberg was a freshman at Brown in 2013, he planned to take full advantage of the open curriculum. He was interested in physics and philosophy and planned to cobble them together into a double concentration. What he hadn’t planned on at the time was taking a course in geology. Then he heard about Jim Head, professor of Earth, environmental and planetary sciences. Rosenberg heard that Head had worked on the Apollo program to train the astronauts and select landing sites for the historic human flights on the Moon. Geo 50 is Head’s introductory course on the geology of the Earth, Moon and Mars. Despite not having much prior interest in geology, Rosenberg quickly became engaged in the class. “He sat up front every day and asked lots of questions from day one,” Head said. “His questions were good ones. Many were still open research questions; we simply don’t have the answers. So I asked him if he would want to come work with us in the lab.” Rosenberg jumped at the chance. He applied for and received a Karen T. Romer Undergraduate Teaching and Research Award (UTRA), which enabled him to stay in Providence for the summer after his freshman year to work with Head. They decided that Rosenberg’s research would focus on one of the key questions in Mars research: What was the ancient Martian climate like? Today, Mars is a frozen desert, mostly devoid of flowing water. But evidence of hydrated minerals, ancient lakebeds, and water-carved valleys make it clear that substantial amounts of water once flowed on the surface. But what does that mean for the ancient climate on Mars? 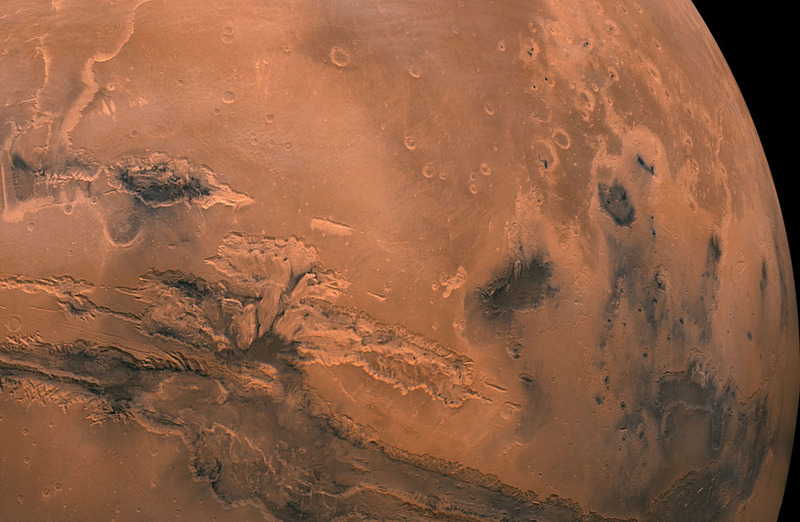 Some scientists think it means that ancient Mars was warm and wet, with water flowing for millions of years. Others think that it may have been cold and icy, with brief pulses of water in response to shorter-term climate changes. Head and Rosenberg decided to look for climate clues in the vast valley networks that stretch for thousands of kilometers across the southern highlands of Mars. If they could somehow get an idea of how much water would have been required to carve those valleys, it might shed some light on the climate conditions at the time. “What we’re looking for is some guidance in trying to understand what was really going on with the early Mars climate,” Head said. But calculating the volume of water that flowed through rivers that dried up 4 billion years ago is no easy task. To do it, Rosenberg used data from multiple orbital instruments, some established theory on sediment transport, and a little help from the Texas Department of Transportation. Rosenberg’s first step was using detailed orbital maps of the valley networks to determine how much sediment had been eroded to form the valleys. The next step was trying to figure out how much water would be required to haul that volume away. To do that, Rosenberg looked through engineering manuals to find equations for such a calculation. Rosenberg wanted to look for something a little more concrete. That’s when he stumbled upon a report by the Texas Department of Transportation assessing how well different types of drainage tunnels are able to handle sediment fluxes. Buried within that report was raw data on fluid and sediment transport for a large number of rivers and streams. Rosenberg found that those empirical data could be applied to the riverbeds on Mars. By doing that, he could make his calculation without using those engineering equations that varied so widely. Using the empirical data led Rosenberg and Head to conclude that the volume of water required to carve valley networks could have flowed through the system in as little as a few hundred to around 10,000 years. The findings imply that the formation of the valley networks may not have required millions of years of flowing water. That means that the networks could have formed even if Mars was cold and icy, with just periodic water flow from occasional ice-melt. The data don’t necessarily mean that ancient Mars wasn’t warm and wet, Head says, just that it didn’t need to be. “What we’re saying is that you could still form these valleys even if ancient Mars wasn’t all beach balls and cabanas,” he said. Head was impressed with Rosenberg’s work on the project. “His quantitative skills and extensive dive into the literature permitted him to bring significant new insight to the range of variables that have perplexed people for so long,” he said. Head wasn’t the only one impressed. So were the scientists who reviewed the paper for the journal Planetary and Space Science, which published the research recently. The work also helped to earn Rosenberg a $10,000 scholarship from the Astronaut Scholarship Foundation, which provides scholarships for a few dozen undergraduates in the United States each year. But Rosenberg isn’t resting on his laurels. He’s moved on to another research project that falls more directly in line with his physics concentration. He’s hoping to publish his results in the next year or so.